ALLEN PARK — After Titus Young’s performance with the media on Friday, it will a be surprise if he ever plays another snap for the Lions. The Lions second-year wide receiver made the situation much worse by not answering questions, other than to say he’s not talking about the past. He had a few days to prepare. He was back at practice on Wednesday and we were told he would talk on Friday. Still, he looked like an idiot. Make that an idiot hiding behind shades. He should have stood up, taken off his Ray Bans, looked straight at the gaggle of reporters and say he was sorry for his inappropriate behavior that was detrimental to the team. Address the fans, tell them he’s sorry and he’s learned his lesson. It’s fine to say you don’t want to talk about the past, but there’s unfinished business and the only way to get over it is with an apology. Young talked for less than two minutes before he was cut off by a media relations spokesperson. It was a disaster from a public relations standpoint. If any Lions fans still harbored hope that Young might make a big turn-around, once they saw the video they probably think otherwise. Hood up, stocking cap in place, did I mention the sunglasses? His teammates were watching and at least one spoke out. Dominic Raiola got a few things off his chest about Titus Demetrius Young. It’s very sad. He’s been given more than one chance. No one knows what goes on behind closed doors with Young and the coaching staff, but he hurt his cause on Friday. He’s let his coaches, teammates, fans and the city down. Obviously, he has no respect for any of the above. ALLEN PARK — If Titus Young has grown up after being sent home for nine days, it doesn’t show. His teammates know it. Center Dominic Raiola made his feelings known Friday, mincing no words. 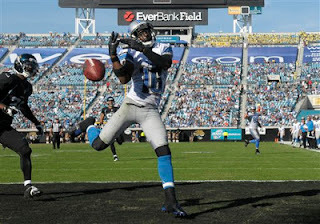 The Detroit Lions wide receiver talked to the media on Friday for the first time since he was shipped home on Nov. 19. In less than two minutes, he uttered about 49 words. Young sat in front of his locker wearing a white hoodie under his Lions practice jersey with the hood pulled up over his ears, over a a black nylon stocking cap. He sported a pair of Ray Ban sun glasses. There was no sun, it was indoors. It was quite the performance and will do nothing to endear him to his teammates or fans. Young wouldn’t not be specific on anything including what led to his suspension. “Well, what happens in house, stays in house,’’ Young said. Raiola said they have not let Young become a distraction. “No, because you know what we’ve moved on, we moved on from him. If he wants to be a (freaking) (expletive), let him be an (expletive). It’s not my problem. What we can control is the guys who want to be here. 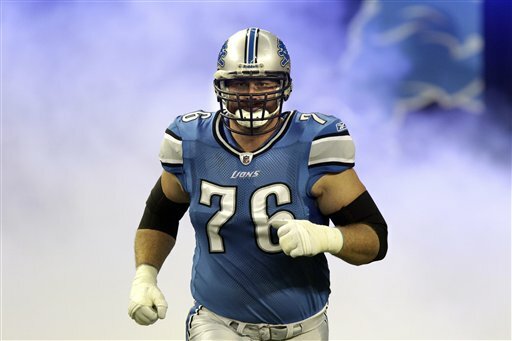 And if you act like that you don’t want to be here,’’ Raiola told the Detroit News. “What I want is the people who want to be here and I think everybody else wants the same thing. So if you don’t want to be here? Just (freaking) leave. “... You know what I’m saying, we’ve got a good group on offense, don’t be a (freaking) (expletive), don’t be an (expletive), don’t be a jerk,’’ Raiola continued. “We’ve got the best player in the world (Calvin Johnson) over there. He should look no further than that to know how to act. If you’re going to act like that, you’re done,’’ Raiola said. Coach Jim Schwartz has not closed the door on Titus’ career with the Lions yet. He said he hasn’t determined if Young will be active for Sunday’s home game against the Indianapolis Colts. “When we get to Sunday we’ll make the decision on who the best 46 are to give us a chance,’’ Schwartz said on Friday. The coach has said that Young will have to earn his way back onto the active roster. “We’re taking it day by day,’’ Schwartz said. He was inactive for the Thanksgiving game. Rookie Ryan Broyles stepped up with six catches for 126 yards. Young had nothing to say to Lions fans and he was given the chance. The second-round draft 2011 pick was given a chance to apologize, clear the air and move on. The media was told on Wednesday that Young would speak on Friday. He had days to prepare. ALLEN PARK — Louis Delmas sat out practice today (Friday) after participating on Thursday on a limited basis. The Lions free safety played in the Thanksgiving game after missing three straight with lingering knee issues. He underwent surgery on Aug. 7. Defensive tackle Corey Williams (knee) also did not practice. He has missed the last three games. Left tackle Jeff Backus was on the field stretching after a limited practice on Thursday. Cornerback Jonte Green, who had missed two practices with an illness, returned to work. Titus Young practiced again and is supposed to talk to the media Friday afternoon. The Lions (4-7) are 5-point favorites over the Indianapolis Colts (7-4). Kickoff is 1 p.m. Sunday at Ford Field. ALLEN PARK — Louis Delmas took a step Thursday toward playing on Sunday against the Indianapolis Colts. Delmas, who has a knee injury, practiced on a limited basis today (Thursday). He stretched along the sidelines with trainers and they took part in a defensive backs drill. He will likely be listed on daily injury report as limited. He had not practiced on Tuesday or Wednesday. Delmas played on Thanksgiving on a limited basis due to swelling in his knee. Previous to that he had missed three straight games and has only played four this season. Also returning to practice was left tackle Jeff Backus who broke his string of 186 straight starts when he couldn’t play on Thanksgiving due to hamstring. Cliff Avril (back) is on his normal practice routine. He practiced Thursday but was out Tuesday and Wednesday. Mikel Leshoure (ankle) and Corey Williams (knee) were also back. The only two missing Lions were Kyle Vanden Bosch (probably a rest day) and Jonte Green (illness). Wide receiver Titus Young returned for a second day of work. ALLEN PARK — Calvin Johnson, the man known as Megatron, has been named the NFC’s offensive player of the month for November. Despite playing on a bad knee, the Detroit Lions wide receiver had 32 catches for 619 yards and three touchdowns in the four November games. That’s a head-turning average of more than 19 yards per catch. Johnson averaged 154.8 receiving yards per game which is the most in a single month since 1963 when Lance Alworth posted 156.3 yards per game over a month for the Charters, according to Randall Liu of the NFL. Johnson has 1,257 receiving yards through the first 11 games and has a chance at breaking the all-time single season record of 1,848 set by Jerry Rice. Johnson is on pace to end 2012 with 1,828 receiving yards. Even though the Lions have struggled and own a 4-7 record (they were 1-3 in November), their passing offense is ranked No. 1 in the NFL thanks to Johnson and quarterback Matthew Stafford who is on pace for another 5,000-yard passing season. ALLEN PARK — Wide receiver Titus Young returned to Detroit Lions practice today (Wednesday) 10 days after being sent home for behavioral issues. Coach Jim Schwartz said on Tuesday that once Young is back he’ll have to prove himself to the coaching staff to get back into a role on the team. Just because he’s at practice doesn’t mean he will be active on Sunday against the Indianapolis Colts. Young will wait to address the media until Friday. Also returning to Wednesday’s practice were LG Rob Sims and RT Gosder Cherilus. Left tackle Jeff Backus (hamstring) didn’t practice. On Tuesday he said he was improving and has a chance to play Sunday. Running back Mikel Leshoure was out. Not sure if it’s an injury or personal day. Also out were Louis Delmas (knee), Cliff Avril (back) and Corey Williams (knee). ALLEN PARK — Titus Young, who was sent home a week ago due to behavioral issues, was not at practice today (Tuesday). It’s uncertain if he is still with the team. Coach Jim Schwartz should address this following practice. Three starting offensive linemen — Jeff Backus (hamstring), Rob Sims and Gosder Cherilus didn’t practice. Sims and Cherilus are new to the injury list. Also missing were Louis Delmas who started on Thanksgiving but couldn’t finish the game due to swelling in his knee. Defensive end Cliff Avril, who has been dealing with a back issue for weeks, did not practice. Neither did defensive tackle Corey Williams. The Lions (4-7) are getting an early start on preparations to play the Indianapolis Colts (7-4) on Sunday at Ford Field. Ndamukong Suh will not be suspended by the NFL, but still faces a possible fine for his actions on Thanksgiving. The Detroit Lions tackle kicked Houston Texans Matt Schaub in the groin during the Lions loss to the Texans, but it was unclear if it was intentional. 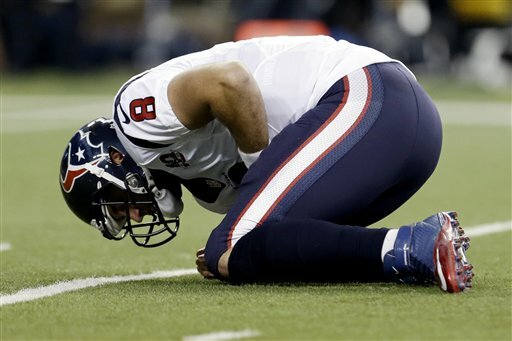 Schaub fell to the ground in pain immediately after the play. NFL spokesman Greg Aiello tweeted on Monday that Suh has avoided suspension and it will be reviewed for a potential fine. NFL fines are usually announced late in the week. Immediately after the game, Schaub said he didn’t want to talk about the kick or Suh. On Monday, Schaub told Houston’s SportsRadio 610 that Suh wouldn’t fit in with the Texans. “You don't want a player like that. The stuff that he stands for and the type of player he is, that's not Houston Texan-worthy. That's not what we're about as a football team, as individuals, collectively as a group, we're not that type of person,’’ Schaub said. Suh is a repeat offender which does not help his case. A year ago on Thanksgiving he stomped on Green Bay’s Evan Dietrich-Smith and was suspended for two games. This season Suh has just one penalty and that’s for encroachment. 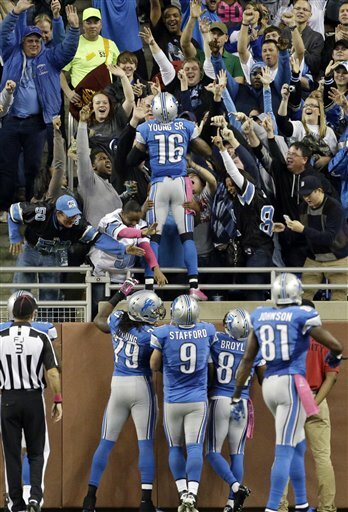 The Lions (4-7) are four-point favorites over the Indianapolis Colts (7-4) for Sunday’s game at Ford Field. It would have been a heart-warming happy ending if the Lions would have won in overtime on a 47-yard field goal from Jason Hanson. Of course, it didn’t happen. The Texans won 34-31 on Thanksgiving. Hanson has 19 career game-winning field goals made in the fourth quarter or overtime. He is tied for most overtime field goals (nine) in NFL history. He had made 12 of 14 field goals this season entering Thursday’s game. Hanson was good from 46 yards in the third quarter to give the Lions the 24-14 lead. But in overtime he hit the upright on a 47-yard field goal attempt. “It just went right obviously. I don’t know what to say. Just started right and went right at the upright so it doesn’t matter if it hits the upright or goes wide it’s no good,’’ Hanson said. It appeared that the snap was low, but Hanson said he didn’t notice. “So yeah it’s a moot point when Nick’s (Harris) a good holder and gets it done. And it’s up to me to get it in,’’ Hanson said. In his 21st season, Hanson has seen it all with the Lions and admitted this was one of the crazier games. DETROIT — Jeff Backus’ streak of 186 straight starts will be broken today. Backus injured his hamstring on Sunday and was listed as doubtful on Wednesday’s injury report. Rookie Riley Reiff will start. Louis Delmas, who has missed three straight games, will start against the Houston Texans in the Thanksgiving game at Ford Field. The Detroit Lions free safety has played in just three games all season due to knee problems. He underwent knee surgery on Aug. 7. Cornerback Drayton Florence, who suffered a concussion early in Sunday’s game but wasn’t diagnosed until Monday, is active and will start for Jacob Lacey who is out with a foot injury. Nick Fairley will start again for Corey Williams (knee) while rookie Ryan Broyles will start for Titus Young who is inactive due to behavior issues. Other Lions inactives are: quarterback Kellen Moore, Corey Hilliard and Ronnell Lewis. Backus is in fourth place on the all-time career games played list. In the NFL, only Backus and QB Peyton Manning (208) have started the first 180 games of their respective careers since 1970 per the Elias Sports Bureau. Backus has started every game since he was drafted in 2001 (first round). He currently holds the mark for the most consecutive starts among NFL active (offensive and defensive) linemen, and he is currently third among all active players with 186 straight starts. Five things the Detroit Lions (4-6) need to do to beat the Houston Texans (9-1) on Thanksgiving at Ford Field. 1. Shake off Sunday’s loss to the Packers. 2. 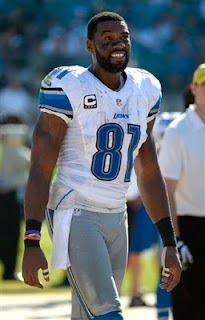 Get the ball to Calvin Johnson who has 24 catches for 479 yards and a pair of touchdowns in the last three games. 3. The defense must keep the intensity up until the bitter end. On Sunday, the defense played well for 55 minutes and 35 seconds. Not quite enough. 4. With Jeff Backus doubtful, rookie Riley Reiff could start and, if so, is going to need some help on the left side. You know the Texans are going to exploit that rookie-ness. 5. With Titus Young out, Ryan Broyles and Mike Thomas will get more opportunities. It’d be a good idea to take advantage. Broyles, a rookie coming off ACL surgery, has been the target nine times in last three games and caught all nine passes for 93 yards. Left tackle Jeff Backus (hamstring) is doubtful to play Thursday against the Houston Texans, although there’s still a chance since he hasn’t been designated as out. Backus has started a remarkable 186 straight games. The Lions didn’t practice Wednesday, so on their injury report they had to project who would have practiced and if they were full or limited. Free safety Louis Delmas (knee) would have been limited in practice. He has missed three straight games and only played in three all season. Cornerback Drayton Florence would have been limited, which means he’s been cleared to play after his concussion on Sunday. He is questionable for Thursday. Nick Fairley (illness), Jacob Lacey (foot) and Corey Williams (knee) are also questionable. 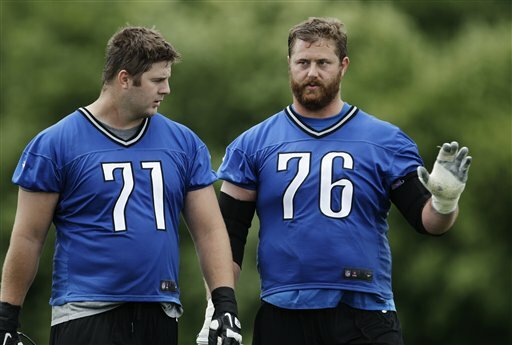 Five things that veteran Detroit Lions left tackle Jeff Backus and rookie Riley Reiff have in common. 1. They both would rather play football than talk to the media. Reiff, who risks life and limb on the football field, is not comfortable especially when the television lights turn on. Backus is much the same way. Both are polite about it which is a bonus. 2. They both excelled at Big Ten schools — Backus at Michigan and Reiff at Iowa. 3. The Lions targeted both, drafted them in the first round. Backus in 2001, Reiff this year. 4. Both are driven with incredible work ethics. If Backus can’t play Thursday due to a hamstring injury, Reiff will get the start. So after practice on Tuesday Reiff and backup center Dylan Gandy stayed on the field for more work. 5. Backus has started in 186 straight games. Reiff just 10. It’s too early to know, but with so many things in common (they both read USA Today too), it seems that Reiff could be a rock on the offensive line for many years to come. ALLEN PARK — Free safety Louis Delmas (knee) returned to practice today (Tuesday) for the first time in weeks. Delmas missed the last three games. He has played in just three all season. He had knee surgery on Aug. 7. Delmas was working out during the portion of practice open to the media, so it’s possible he didn’t participate fully. Missing from practice were Jeff Backus, who injured his hamstring Sunday and couldn’t finish the game, along with cornerback Drayton Florence who finished the game, but was diagnosed with a concussion on Monday. Defensive tackle Corey Williams (knee) who has missed the last two games also returned to practice. Nick Fairley started in his spot Sunday and had his best game so far for the Lions. Wide receiver Titus Young, who was sent home on Monday for behavior issues, also did not participate in practice as expected. Coach Jim Schwartz announced on Monday that Young will be inactive on Thursday. Thursday will be the Lions 73rd game played on Thanksgiving and the first with the Houston Texans as an opponent. The Lions have won just one of the last 11 Thanksgiving games. That was in 2003, a 29-27 win over the Green Bay Packers. — About one sentence into Jim Schwartz’s announcement that Titus Young has been benched for Thursday, writers started pulling out their phones. Schwartz stopped in mid-sentence to ask if we were tweeting the news. Of course we were, it was big stuff. Then he carried on. Until he mentioned Drayton Florence was diagnosed with a concussion. Then it was Tweet time again. — Matthew Stafford, who was understandably quiet and sullen immediately after Sunday’s loss, was in a little better humor on Monday. When asked about what it means to play on Thanksgiving (with a suggestion that he should be emotional), he mimicked wiping a tear from his eye which drew plenty of laughs. Stafford probably/hopefully has more enjoyable parts of his job other than talking with the media, but he gets it and delivers. Post-game Sunday was not easy, but he was there and did his best. — There’s a lot being made over the fact that cornerback Drayton Florence was diagnosed with a concussion on Monday after getting dinged on the first play on Sunday. He passed the concussion tests on the sideline and played a good game, his first since he broke his arm on Sept. 16. It’s not uncommon for concussion symptoms to show up the next day. His came via a headache on Monday morning. — The day Titus Demetrius Young was drafted in 2011, he totally charmed the Detroit media in a conference call. He was SO excited about coming to Detroit where he had family. That seems like a long, long time ago. — Rookie Ryan Broyles will be getting more action with Young out of Thursday’s game. Schwartz reminded us that he is still coming back from his ACL surgery a year ago. “I think he’s right around a year right now. Other than Adrian Peterson, it’s usually the next year when you start looking like yourself. ... He has been productive in his role now his role will increase,’’ Schwartz said. — Remember all the fans who ripped the Lions for drafting Broyles in the second round? What are they thinking now? On Thursday, Broyles will be the No. 2 wide receiver. — Nate Burleson took Titus Young under his wing from the get-go. With Burleson out with a broken leg, perhaps Young is floundering without the veteran’s advice. Doesn’t matter. “This is personal behavior and the only person to be accountable is the person, which is Titus,’’ Schwartz said. 2. Titus Young is no Nate Burleson. Young stepped up to the No. 2 wide receiver position after Burleson was lost for the season with a broken leg. Young was targeted six times on Sunday and made one catch. He has to work harder at getting separation from defensive backs. I did see him working after practice two days last week with the Jugs machine working on catching low balls. He’s got plenty more work to do. He was expected to have a breakout season, but like the rest of the offense his play has been way too inconsistent. Burleson is missed big-time. 3. Defensive coordinator Gunther Cunningham said last week that he’s told the defense they have to play the same no matter the score — there can be no letdowns. Well, guess what? They let down in the fourth quarter and were rewarded with a loss. It’s not all on them, the offense needed a touchdown late and couldn’t make it happen either. But had the defense held the Packers instead of allowing a 22-yard touchdown pass from Aaron Rodgers to Randall Cobb, we would be marveling at the Lions ability to beat a quality division opponent. 4. 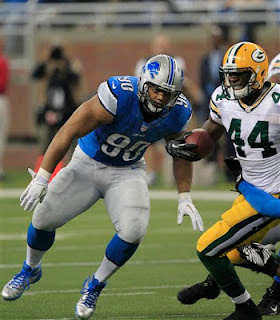 Ndamukong Suh is who we thought he might be. The last two weeks it was tough to see his impact on the game, even though the coaches assured us it was there. On Sunday there was no doubt. He was a force and the five tackles just begin to tell the story. Also Nick Fairley, who seems to play better when he starts, was the defensive player of the game with two sacks, seven tackles and a forced fumble. Sunday’s game was the reason the Lions drafted Fairley in the first round, now he has to play like that consistently. 5. After 10 games (4-6) the Lions get one grade from me — a D for disappointment. Last season was not a total fluke and most of the starters have returned. Injuries are not an excuse, every NFL team must deal with them. Lack of execution has played a huge role as well as being slow to make adjustments. It’s not just the players, this is on the coaches too. Playoffs are a distant dream so it will be interesting to see how they finish out the season. 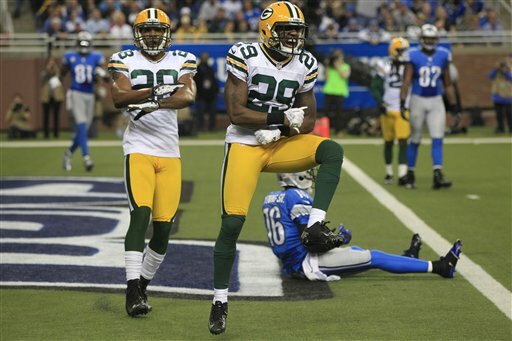 DETROIT — Ricardo Silva and Erik Coleman will start at safety today as the Lions face the Green Bay Packers at Ford Field. Safety Louis Delmas (knee) is out for the third straight game. Delmas had been listed as doubtful on Friday’s injury report. While safety Amari Spievey is out for the season after being placed on injured reserve on Saturday. Nick Fairley will start for Corey Williams who was listed as out on Friday’s injury report. He’s been dealing with a knee and also missed last week’s game. Cornerback Drayton Florence is active for the first time since he broke his arm on Sept. 16 at San Francisco. Cornerback Pat Lee who was claimed off waivers this week from the Raiders is active. Other Lions inactives: Quarterback Kellen Moore, wide receiver Brian Robiskie, defensive end Ronnell Lewis; offensive linemen Jason Fox and Corey Hilliard. Out for Packers are: safety Charles Woodson (collarbone), linebacker Clay Matthews (hamstring), wide receiver Greg Jennings (groin/abdomen), tight end Andrew Quarless, wide receiver Jarrett Boykin, cornerback Sam Shields and linebacker Terrell Manning.